Soon after India attended its first plenary meeting as a member of the Missile Technology Control Regime (MTCR), the Indian and Russian governments decided to extend the range of the supersonic BrahMos cruise missile, which would make it even more lethal. The governments of India and Russia agreed to extend the range of the BrahMos supersonic cruise missile, doubling it to 600 kilometres, soon after India attended the 30th plenary session of the Missile Technology Control Regime (MTCR) as a full member. Sources confirmed to RIR this week that the two countries had agreed, in principle, to increase the range of the BrahMos to almost double its current capacity. However, they denied that India’s membership of the MTCR was directly related to the decision. According to an official with the Indian Ministry of Defence (MoD) quoted by ‘Defence News,’ a definitive portal on defence-related news and opinion, it had become possible to extend the range of the joint venture BrahMos cruise missile because of India's entry into the Missile Technology Control Regime. India attended the 30th plenary session of the MTCR held in Busan (South Korea), from October 17 to 21, 2016, for the first time as a member. India joined the MTCR earlier this year, in June. The MTCR aims to restrict proliferation of missiles, complete rocket systems, unmanned air vehicles and related technology for those systems capable of carrying a 500 kilogramme payload for at least 300 kilometres, as well as systems intended for the delivery of weapons of mass destruction (WMD). India's entry into the MTCR will help to the extent that Russia and India can acknowledge that the range is above 300 kms. It has been believed that the range of the BrahMos was specified at 290 kms primarily to avoid complications for Moscow in the transfer of technology and materials for the BrahMos, since Russia has long been a signatory to the MTCR. BrahMos's range means it falls short of the 300km limit set by the MTCR. Being a signatory to MTCR does not imply that there are no restrictions in missile technology transfer and trade, particularly when range and lethality are involved. In this context, sources told RIR that China was not a member of the MTCR and had transferred some missiles to Pakistan, among others (including North Korea) which exceeded the prescribed range of 300kms. The sources pointed out that India and Russia would not be violating any laws because they were not exporting the extended range missiles but, as members of the MTCR, they could extend the range as the BrahMos was a jointly developed missile and this would be “a natural extension” of joint research efforts. The agreement to extend the range was among those taken on October 26 at the 16th Indo-Russian Intergovernmental Commission on Military-Technical Cooperation (IRIGC-MTC), co-chaired by Indian Defence Minister Manohar Parrikar and his Russian counterpart, Gen. Sergei Shoigu. The defence ministers at the meeting reviewed decisions taken by the leaders (President Vladimir Putin and Prime Minister Narendra Modi) during the India-Russia summit in Goa, and looked at ways to expedite the agreements while looking at further areas to move ahead. Defence News quoted a scientist with the Indian Defence Research and Development Organisation (DRDO) who said, "only very minor changes in software and hardware are required" to increase the range of the supersonic missile. “BrahMos is a world-class weapons system and there is no equivalent in the world today. Speed, precision and power, all exists in this system," Praveen Pathak, a spokesman for the manufacturing firm BrahMos Aerospace Limited told Sputnik. 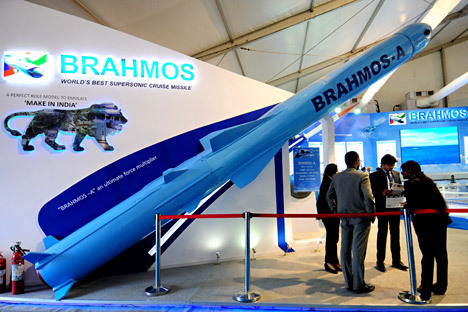 BrahMos Aerospace, co-owned by the Indian and Russian governments, manufactures the supersonic cruise missile, named after two rivers, the Brahmaputra and the Moskva. Since BrahMos conforms to the characteristics of the Russian P-800 Oniks/Yakhont anti-ship missile, no major modification is required to achieve 600-kilometres range, said Rahul Bhonsle, a retired Brigadier and Editor of ‘Strategic Foresight Asia’ which closely follows and covers all defence-related issues. Modifications to the missile would, however, be required to provide greater stability over the longer range and corresponding accuracy. Bhonsle said operationally, the increase in range would overcome restrictions of deployment for the ground based version of the missile. “This will extend the area of influence as well as provide greater flexibility in employment. On the other hand, for the naval and the yet to be deployed air launched version (to be fitted on to the Su-35MKI) this will provide the advantage of extension of range in engagement as well as standoff distance,” the military analyst pointed out. A source told RIR that the move was still at the planning stage and it would be several years before the project was fulfilled, but declined to specify any time frame.